How This Mom of Two Made $2700 Proofreading Part-time! Proofreading is one of the lesser known work from home job that’s gaining immense traction these days. I often talk about the best ways to work at home and make a decent income doing what you love, proofreading is one of them. For some of you, this might come as a surprise if I say, Proofreaders can earn up to $40,000 annual income (some proofreading jobs pay up to $65 per hour) staying at home. That’s the potential of this side hustle and you don’t even have to work full-time (just like this mom of two does). There is an incredibly high demand for proofreading worldwide, and the best part is that you don’t need to be in any specific location to do the job… it’s all from your computer or tablet! Disclosure: This post may contain affiliate links. Here’s what that means? As a proofreader, your job is to look for possible corrections in files, do the necessary editing, and make the copy perfect. It takes a certain “eagle eye” ability, and a knowledge of grammar to be good at proofreading. Have the necessary skills? Then, you’re good to go even if you don’t possess any prior experience. If you’re interested in taking up this side job, you’ll definitely learn how to do it the right way after reading this post. Dive in and learn to become a proofreader from home! 1. Hi Peggy, Can you please tell us a little about yourself and your work? 3. How do you realize that Proofreading is the perfect work-at-home career for you? 4. How long have you been in this career? And when did you start seeing money come in? 5. 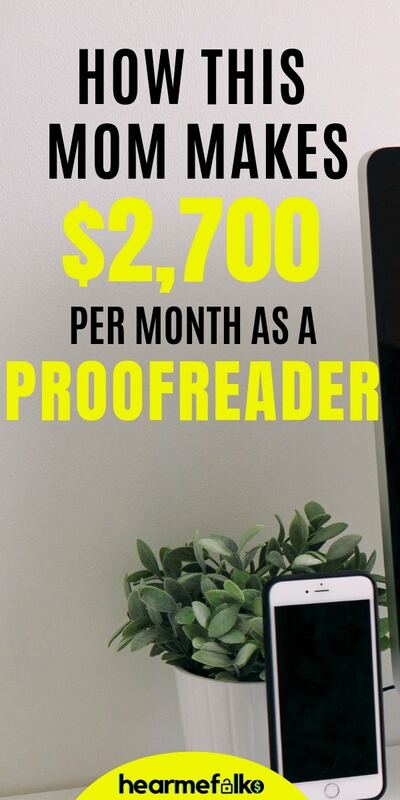 How much money do you make per month as a proofreader? 6. In your opinion, what are the three core skills and tools that are needed for those side hustle? 7. Did you get trained prior to getting into this career? If so, what helped you the most? 8. How did you land your first project/client? 9. What are some big obstacles you had to overcome getting started? And what surprising lessons have you learned along the way? 10. What advice would you give to someone wanting to become a proofreader? Do you recommend any course which can help you in this journey? Why did I choose Caitlin’s Proofread Anywhere Course? I am a blogger, proofreader, and virtual assistant. Usually, small businesses and court reporters seek out my services. My children are 20 and 17; I have a boy and a girl. We also have three dogs and one cat. Talk about a full house. Currently, I proofread for small businesses, bloggers, and court reporters. Proofreading by definition means to read through any printed or written material and mark any errors. These can be spelling errors, grammar errors or even transposing words or letters. I proofread in PDF format. This means that my client sends me an assignment in PDF format and I mark up the errors using my Apple Pencil on my iPad. At times, a client will request that I proofread their work and compare it to an audio file. To proof with audio, I use a program and a foot pedal, and I also mark up the errors that I find using the audio on the PDF file. In these instances, I can find a whole sentence that may have been dropped. In 2013, after having shoulder surgery, I quit my secure job with the county of seven years and relocated 100 miles away. I also had to leave my side hustle as a massage therapist of nine years. I didn’t mind the time off at first. Then I got bored hanging out on the genealogy sites. So I started job hunting again. I went to so many interviews for jobs that my head was spinning. Either I didn’t get a second interview, or I was offered the job, but they wanted me to work rotating shifts. My kids were still too young to drive, and I was their primary transportation to and from school and activities, so it didn’t happen. I just couldn’t find a job that fit my family’s needs. One day, I was searching Pinterest for a work-from-home job. I found a handful of them but was afraid to commit to any of them because I refused to be scammed. So I read all of the pins, blogs, and info I found and saved it to a board. From 2013 to August of 2017, I continued being a chauffeur for the kids, building my family tree, and helping others build their trees. Then one day in August I was cleaning up my Pinterest boards and ran across the pins that I saved years earlier. The one that resonated with me was the pin about proofreading from home. In a couple of my previous jobs, I taught quality control, another word for proofreading, finding errors in the computer systems that can cancel benefits or cause you to lose a construction bid. After a week I kept coming back to it, and I finally decided to pull the trigger. My first job was proofreading invoices from 1988 to 1996. I had a job with an information service company from 1996 to 2002. My quality control job was from 2007 to 2013. When I completed the course on April 5, 2018, I had to learn how to set up my website and market myself. YouTube videos were watched religiously, like college courses. My domain name was purchased in March of 2018. I spent April marketing my new business. In May of 2018, I received my first paying job. So it took me three to four week to land a client, and as of today, I have had my own proofreading business for 11 months. At the moment, I am only proofreading part-time. My largest money making month was $2,700. These last six months I have had a couple of surgeries. Yay! I am cancer free. My daughter also has weekly doctor’s appointments. The freedom of my job is priceless. In 2013 when I had surgery I was working at my 9-to-5 job and the doctor wouldn’t let me return to work for eight weeks. After these last two surgeries, I was working by the third day at my own pace. Working on my iPad at the doctor’s office is normal for me. First and foremost, you need to have good communication skills. Second, punctuality. Always meet your deadline given. If you can’t honor your deadline refer to the first skill of communication and let your client know immediately that you can’t finish the job. Third, it would benefit you if you could grasp grammar rules. You are not expected to memorize them all. However, it helps if you are familiar with the rules and know where to find them. Paying close attention to detail will benefit you in this business. Also, proofreading software rarely catches the errors of homonyms and transposed words. The software also doesn’t make suggestions based on your client’s preferences. My most used tools are my reference books, my iPad, and my audio player software. Now some proofreaders don’t use an iPad or the audio player software. It is always best to find which PDF editing program works for you. Having previous jobs that required proofreading, I feel that being held accountable for the work completed helped me most. If an error was made in my previous job, then welfare benefits were canceled, or a construction customer may have lost a bid. In my current business, this is where communication and asking for feedback on my work help me become better at my job. Since I was new to our community I went to our chamber of commerce networking events. Thinking out of the box and networking with the community helped me land my first job. Fear of being scammed paralyzed me from success from 2013 to 2017. Also, once I got started on the course self-doubt would deter my progress when I didn’t score as well as I should have on a practice assignment or test. I have learned that my own fear was the only thing holding me back. As long as you keep moving forward, it doesn’t matter how long it takes you to get through the course. The other proofreaders are a great support system. They are not my competition. In my eyes, they are my peers; my coworkers; my lifeline. If I am ever swamped with work, I can go to them and ask for help. They are a great resource for questions and advice. I recommend Proofread Anywhere, not just because that is the course that I took, but because the first seven days are free. My advice to a potential proofreader would be to try the free 76-min workshop. With me being a type A personality it made complete sense. The course reviews stated that the course could be completed in two or three months. It took me six months to complete. One area that most online courses don’t teach is the part where you actually go out into the real world and apply what you’ve learned. Caitlin’s 40+ lesson course is spread across eight modules, and FOUR of those modules are dedicated to either finding proofreading work or managing a freelance business! Well, if you enroll in this course, you’ll not only gain the skills needed to succeed as a proofreader, you’ll also learn how to monetize your skills and create a successful business. Don’t listen to me, though. Check out Caitlin’s FREE 76-minute workshop, where she goes into detail on what the course includes and how it will benefit you immediately after graduating. How to use one of the most popular proofreading tools out there… and learn a few places to find clients! So if you want to learn more, you can get access here. You can check her detailed review of Proofread Anywhere course right here. If you decide to move forward, then get the suggested reference books and study them along with the course modules. Most can be found used on Amazon. Also, reach out to the other proofreaders and make friends. I am an introvert, so doing this has helped me reach out more and improve my communication skills that are needed when speaking to clients. Thank you so much for interviewing me. Anytime I can share my journey I get excited. If I can do this at 46 years old, then anyone can step out of their comfort zone and find their work-from-home freedom. Proofreading is the up-and-coming profession that — due to the rise in popularity of self-publishing — will start to become more competitive in the coming years… so better get on board now and become an expert! Want to learn to proofread from an expert 6-figure proofreader, be sure to check out this FREE WEBINAR to learn the secrets to make up to $65 per hour with freelance proofreading! Don’t miss this opportunity to learn proofreading skills from the best! If you’ve been looking for some amazing work-at-home options, I got you covered! Check out my interviews for real-life stories of people making money from home doing what they love! How to Make $2,000 a month Freelance writing from Home? How this Stay at Home Mom Makes $2k a Month as a VA? How this College Student Makes $2700 a Month as a Part-time VA? How This Newbie Blogger Makes $3000 per Month in Just 6 Months? Nice idea, thank you for the post.